Williamsburg, Brooklyn was my regular haunt when I lived in the city and despite the gradual gentrification of the neighbourhood, its magic is thankfully still intact. This is the notorious neighbourhood where you can indulge the wildest fantasies of the secret hipster within you. As you emerge from the Bedford Ave. subway, there is a giant chalk circle across the corner labelled ‘kissing spot’, where you are supposed to embrace any passer by you fancy. Sadly, I don’t think this kind of random intimacy/physical contact would be quite so enthusiastically embraced in London, but I like the idea. It perfectly captures the friendly, somewhat eccentric ambience of Williamsburg. The Williamsburg Flea market on a Sunday is by far my favourite flea market in the world. This is a big complement given that I have become a bit of a thrifty connoisseur. In the last few years I’ve abandoned the high street in favour of gradually filled suitcases with my finds from Paris and London’s most obscure markets - sifting through boxes in search of velvets and lace. Actual vintage shops are usually painfully expensive, so I would always recommend heading to your local flea market or charity shop to find some diamonds in the rough. The eclectic range of stalls, the setting and the accompanying gastronomy of Williamsburg Flea make it an unbeatable way to spend the morning. It lies in the shadow of the majestic Williamsburg Bridge and the accompanying vision of the Manhattan skyline across the river is just gorgeous. You must take your food out onto the waterfront when you’re finished with the sifting. It's a great place to take a little nap. They specialise in the weird and wonderful, but if you don’t have some shabby-chic Brooklyn loft waiting for an influx of distressed furniture then you’ll probably be looking to the smaller trinkets. My favourite objects to seek out are vintage photographic slides (as seen in the plastic cover above) from the turn of the century from a seller by the water whose collections of misshapen light bulbs and abandoned keys are equally enticing. As you walk back to Bedford Ave., you cannot pass by 16 Handles Frozen Yogurt without at least exploiting their self-service taster service. A monumental error in terms of the company's overall profit, because a worrying proportion of the ‘starving’ artists seem to simply reuse tester cups for all 16 flavours before waddling out without making a single purchase. As anyone who knows me well will guess, I am also very guilty. Nevertheless, 16 self-service flavours like birthday cake, green tea vanilla or caramel popcorn are inexplicably delicious when piled with scoops of toppings like mini cheesecake, lychee fruit or cake crumbs. And there are so many vegan, gluten-free, sugar-free options, which is very exciting for me. Also, all along Bedford Ave. there are endless signs for fabulous organic and vegan food shops selling all the superfood and healthy delights, which you’d pay double for in Wholefoods, Soho. But, panic not, the Bedford Cheese Shop (229 Bedford Av) - which wouldn’t be out of place in a Dorset village - is always an option for the more civilized amongst you. Make sure you stop to appreciate the incredible street art all around you as well as the little tables of exquisite handmade jewellery on the corners. You can not only sense the creative energy of the place, but see it all around you. Love Is Telepathic was my favourite street art campaign this year, which dotted the pavements in the form of cherry red stickers. As you’re taking in the art, do be careful that it’s not too contemporary lest you follow in my footsteps and lean against freshly painted pink walls in a new white dress. Luckily replacement will soon be found in Beacon’s Closet (74 Guernsey Street). Best described as thrift shop heaven, it's open all week with frighteningly cheap price tags – the stingy hipster’s dream. Just think of all the beautiful people dropping off their black bin bags of vintage golddust every day – ready for your arrival. Their selection of fur coats and men’s leather jackets is worth the hike. Feel free to go a little overboard when trying on the more eccentric pieces. Below is our interpretation of Big Fat Gypsy Weddings meets Abba. 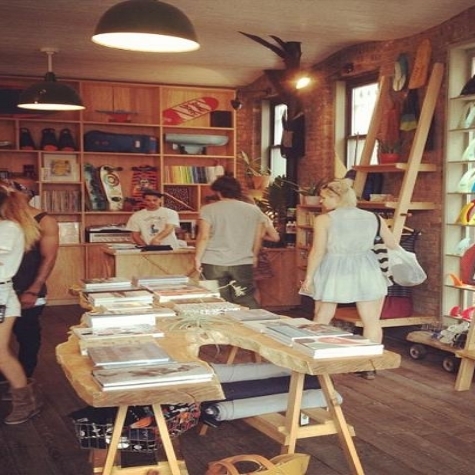 Also, Pilgrim Surf and Supply (68 N3rd) is the coolest surf shop you will ever visit. With a nihilistic, wooden interior, beautiful, hand crafted boards and tables of wonderful photography from around the world, it’s a must see. The walk down there is pretty gorgeous too. If you need to click refresh after all the shopping, the Rabbit hole (352 Bedford Av) is most charming place to stop en route to Williamsburg Bridge. Whether it is for Norwegian eggs benedict or freshly baked raspberry pastries it is an intimate gathering place for old souls. They ban laptops and working in their candlelit café, leaving space for good old conversation and a giggle with the cohort of beautiful bartenders. The aged wooden interior could’ve been the setting of a Kerouac novel, but with an added Parisian twist - a la Hemingway. If you want to save $2.50 and bask in mankind’s architectural triumphs, then the only way to get back to the city is traversing the Williamsburg Bridge at sunset. Not only will you be hypnotised by the swarms of beautiful, bearded hipsters flying by on their vintage Bianchi bikes, but also the view across the river is enchanting. The rather long walk feels like a somewhat spiritual experience, like a scene from a coming of age indie flick. Through the pastel pink railings of this historic structure you can watch the sun setting on the purple peaks of New York’s skyscrapers. But, the greatest joy for me was stepping over the poetic declarations of love scrawled onto the pathway by aspiring Ezra Pounds. The elusive Mana wrote on the pathway, ‘I am the beat of a thousand purple butterflies’ and I still wonder what this inspired creature does with his life.